Data science is at the core of everything Stitch Fix does – from the way their teams are organized to the way they route shipments throughout their warehouses and everything in between. As founder Katrina Lake puts it, “Data science isn’t woven into our culture; it is our culture. We started with it at the heart of the business, rather than adding it to a traditional organizational structure, and built the company’s algorithms around our clients and their needs.” By introducing machine-learning to fashion, Stitch Fix is able to not only more accurately predict customer needs but it’s also able to predict our future demands, which in turn creates a competitive edge over traditional retail companies. 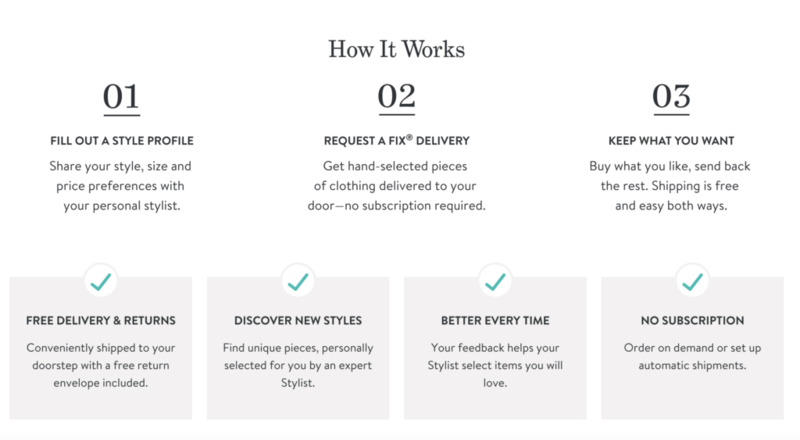 In the short-term, Stitch Fix’s goal is to accurately predict a customer’s style preference in order to deliver a clothing shipment that satisfies the customer’s needs. The learning begins when a new customer fills out a detailed profile upon entering the website for the first time. This helps mitigate some of the inherent cold start challenges that any machine-learning business will face. From there they use “Collaborative Filtering” to make a recommendation based on a combination of what Stitch Fix already knows about this specific customer in addition to other like-customers. Next, a human stylist will review the recommendation and adjust the final shipment based on her judgment and knowledge of the customer and context. The final step to the learning process is the customer’s feedback. Once she receives her box of clothing she chooses to keep or return items. Her decisions, in addition to specific product reviews, feeds the knowledge-based learning approach to their machine-learning model. In the medium to long-term, Stitch Fix’s goal is to take learnings from their existing styles and business models in order to build out new collections as well as new business lines. Through their machine-learning approach Stitch Fix has been able to expand their business beyond women’s clothing into men’s and kid’s lines as well. They’ve also developed an in-house collection, Hybrid Design. All of this allows Stitch Fix to react much faster than their competitors to new customer tastes and preferences. And unlike other retail companies, their predictions are not based on a single Creative Director’s tastes and preferences, but rather, they are directly informed by the consumers. In order to accurately predict a customer’s preference using Collaborative Filtering, one must possess a large enough data set. For a smaller sample to be just as effective, the assumption one makes is that new customers are very similar to older examples. 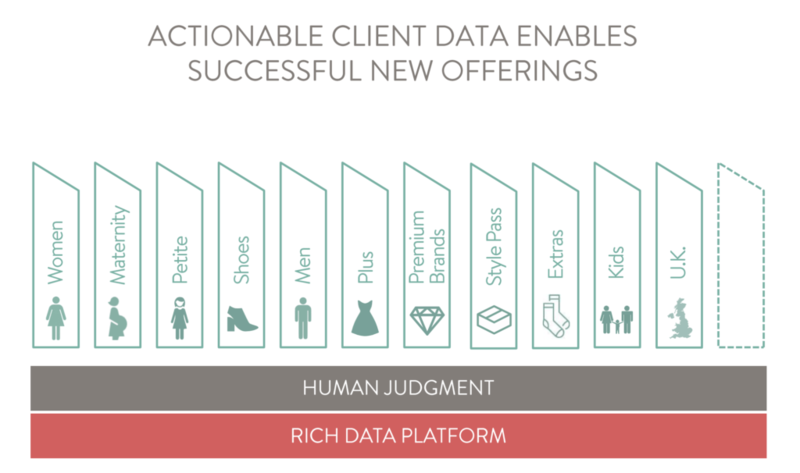 As Stitch Fix looks to expand into new markets (they’ve recently announced plans to move into the UK by the end of 2019), I would consider investing much more heavily in human input as I question how transferrable their US client data may be. This could be in the form of explicit input from customers as well as heavier reliance on human stylists as they build out the market. Secondly, I would think about the tradeoffs Stitch Fix is making when choosing to leverage data science in trying to combat their potential problem of concept drift. Our interests and tastes gradually change over time but machine-learning models are not always designed to capture and account for these changes. Although Stitch Fix employs “Mixed Effects Modeling”, which allows them to track and learn from their clients’ changing preferences over time, I worry about machines not being able to truly capture the emotional aspects of moving through various life stages. For example, can the best natural language processing technology truly capture the emotions that come with buying pregnancy or post-partum clothing as you potentially struggle with your insecurities around body image? What is the right balance of human input and machine-learning? Can algorithms truly capture emotions associated with buying behavior? And if humans are getting involved, how much value is there in the machine-learning output? How would you combat the cold start problem in new markets? Is it safe to say customer preferences in the US are similar enough to what we’ll see in the UK? Or is it more beneficial to start from scratch? Marr, Bernard. “Stitch Fix: The Amazing Use Case of Using Artificial Intelligence in Fashion Retail.” Forbes, 25 May 2018, https://www.forbes.com/sites/bernardmarr/2018/05/25/stitch-fix-the-amazing-use-case-of-using-artificial-intelligence-in-fashion-retail/#317818473292. Accessed 12 Nov. 2018. Lake, Katrina. “Stitch Fix’s CEO on Selling Personal Style to the Mass Market.” Harvard Business Review, May 2018, https://hbr.org/2018/05/stitch-fixs-ceo-on-selling-personal-style-to-the-mass-market. Accessed 12 Nov. 2018.
 https://algorithms-tour.stitchfix.com/. Accessed 12 Nov. 2018. Web, Pazzani, and Billsus. “Machine Learning for User Modeling.” https://link.springer.com/content/pdf/10.1023/A:1011117102175.pdf. 22 May 2000. Accessed Nov. 12 2018. Alexey Tsymbal. “The problem of concept drift: definitions and related work.” http://citeseerx.ist.psu.edu/viewdoc/download?doi=10.1.1.58.9085&rep=rep1&type=pdf. 29 April 2004. Accessed Nov. 12 2018.
 https://stats.idre.ucla.edu/other/mult-pkg/introduction-to-linear-mixed-models/. Accessed Nov. 12 2018. This is a very interesting read. From my understanding of StitchFix’s business model, they continue to employ stylists for the exact reasons you mentioned – capturing emotional/contextual inputs that the algorithms would miss, such as special occasions, pregnancies, etc… As to your question of how much value there is in the machine learning algorithm, I personally think it is a lot. One reason is that I believe in their claims that these algorithms lead to better recommendations. However, even if most of the clothing decisions actually did come from the stylists, the algorithm adds a lot of value as a marketing tool. The company has generated a lot of buzz and free marketing due to this innovative approach…I first learned about them through Katrina’s appearance on the “How I Built This” podcast, which may not have invited her on as just another clothing company. Great article! It is interesting to see ML-driven recommendations applied in a less ‘triable’ product type than what we may be used to in media/digital-driven plays (Netflix, Amazon, Spotify, etc.) – whereas I could easily listen to 15+ songs in an hour of Spotify, and therefore generate 15+ data points to feed their model, StichFix only gets a handful of data inputs per month. Anecdotally, I’ve observed that StichFix does tend to stick to one, fairly narrow aesthetic in their recommendations – I wonder if this may be due to the fact that their model doesn’t have enough data to develop truly nuanced user ‘types’ that deviate meaningfully from their core users’ preferences (e.g., the model just converges towards the mean user, causing other users to drop out because they don’t like their clothing selections, which further reinforces homogenous user preferences in their model). This would be another argument supporting your recommendation for greater human curation! Awesome article! Fascinating how they built this business. Related to @kgf above, I worry about the narrowing effect, that with too few data points the algorithm will provide bland recommendations rather than bold new style choices. It’s for this reason that I doubt machine learning can be truly creative, and why human intervention is needed. Relatedly, I think starting from scratch in the UK is the best way to build up a sufficient data set. I also might consider ways the company could increase its data points on style preferences. What if they integrated a Pinterest-like feature, enabling users to like or pin or upvote styles they enjoyed? This might give the algorithm a sufficiently large data set to better recommend with more nuance. I would strongly believe that algorithms could truly capture emotions associated with buying behavior if they were trained for that. You can get insights from the customer on the occasion she is interested in and/or on the life stage she is in at that moment and based on that direct her to a new pool of data uses machine learning from previous customers on similar situation. Regarding to the expansion plan, I would say it is better to start from zero in UK and so be open to the opportunity of capturing some white spaces that you would not capture if you were already excluding those clothe’s options by following US algorithm. This is an interesting concept and something I’ve wondered about for a while. Their model is intriguing, but I think it is difficult to capture the true emotional benefit of buying behavior. A lot of purchase behavior is tied to psychology (or deep-rooted) thought processes that we may not be aware of. I’d be curious to see if they have looked into tying in psychologists from various backgrounds to build out initial consumer behavior trends and/or buying behavior. You also make a good point about “mixed effects modeling” which I do think is interesting because it ties in past behavior vs. (potential) future behavior and aspirations. Great article Gab as this is a cutting edge feature a lot of retailers are considering. For me, it depends on the value proportion of the brand. Leveraging machine learning to design a fashion line will make the brand a follower. By understanding what good designs exist in the market and building on them, you’ll have your product reading in 8-16 weeks (depending on how efficient the operations team is). 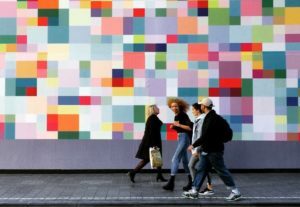 If the brand is happy with this trade-off, then leveraging machine learning will have significant cost efficiencies as you’ll not depend on a “costly” creative team. Thank you for this Gaby, really enriching. Great article! StichFix really has an interesting approach, and I believe that there is definitely a role for machine learning in the fashion world. However, you pose an interesting question – what is the right balance between data and human? We have recently seen Gucci turning around, without the use of data, but instead focusing on a “brilliant” head designer. It’s likely that data will come in to the mainstream more and more, but that the high end “innovative” side of fashion will not be as disrupted, as that end of the fashion industry is more akin to art than to products – something that is difficult to imitate with data, since it is by definition backwards looking. Thanks for sharing your thoughts on a very interesting subject! I also have concerns around the applicability of StitchFix’s offering to emotionally-charged purchases- more because of the process of communicating with the client and the mode of delivery rather than the actual clothing. Most of the machine learning recommendations are just checked by humans and not interfered with so the human stylist’s role is more as a filter to sense-check the machine’s decisions. As the algorithm sees more clients with similar profiles (e.g. women post-partum), it should be able to recommend more appropriate clothing. I do worry about the hand-holding required alongside such purchases e.g. with changes in weight/body-shape, is it better to deal with someone face to face so a client can try different sizes and pin an item for tailoring. Going forward, I see the human stylist in more of a customer service function than a styling function for the mass market segment. Similarly, this is why purchases that are more luxury / for special events are also not catered for given clients do not feel the personalised service which can only come from a human. Thanks for the great article! I think that these clothing subscription sites need to be a mix of human involvement and machine learning. 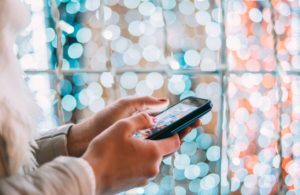 The machine learning is needed for the business to be scalable while the human interaction is needed for the personal experience of shopping and buying new clothes. The human involvement can also be the final filter that corrects the mistakes of the machine. I have heard stories of women who have used Stitch Fix and showed up to work in the same outfit as their coworker. I think that the machine should be able to anticipate and avoid this issue but employees could also double check this. I don’t think the US style is transferrable to the UK – I think Stitch Fix should start from scratch. It should collect data from other sources that the machine learning can utilize and it should focus more heavily on human involvement while launching the business in the UK. As it gets more data points, it should be able to leverage the machine learning more but should still keep some element of the human involvement.